Streaming video or music from services like YouTube or Pandora is great for sampling a wide variety of stuff, but sometimes all you want is media from your own collection? Here's a look at five great solutions for streaming your personal media. Earlier this week we asked you to share your favorite personal media streaming tool, and now we're back to highlight the top five contenders. The focus this week is on personal; all these tools are designed to stream from your personal collection of media to elsewhere on your home network, over the internet, or both. 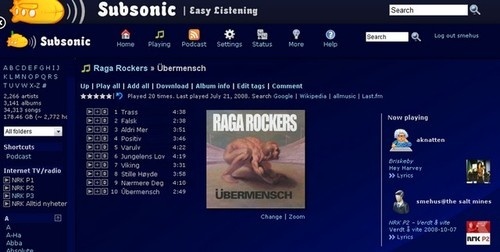 Subsonic is best know for rock-solid music streaming over the internet to web browsers and other supported devices, but unbeknownst to many, it can also stream any video format that supports HTTP streaming, such as AAC. Subsonic supports plugins for transcoding tasks which makes it easy to adapt to new formats. Although many people use it for local streaming around their home network, you can access Subsonic remotely using the web-based interface or grab one of the Subsonic apps for Android and iOS devices. Subsonic is free, but in order to use it in conjunction with any of the mobile apps beyond the 30 day trial, you'll need to "donate" to the Subsonic project to get a license key; donations start at around $15 USD. 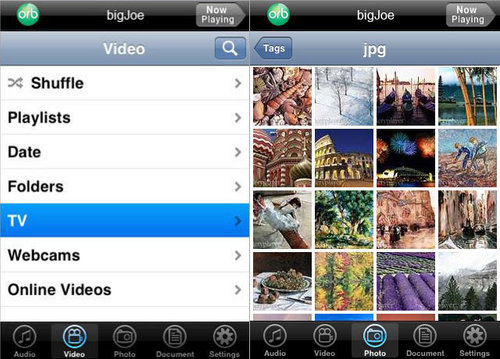 Air Video is a dead-simple streaming solution for iOS devices. Rather than go through the hassle of re-encoding all your media for playback on your iOS device, Air Video transcodes it on the fly to turn your iPhone or iPad into a mobile media center. You install the server software on your Mac or PC, install the $2.99 application your iOS device, and enjoy easy file browsing and streaming media. If you want to try it out before dropping the $3, take it for a test drive with the free demo, which limits you to streaming the first 3-5 media files in each folder. 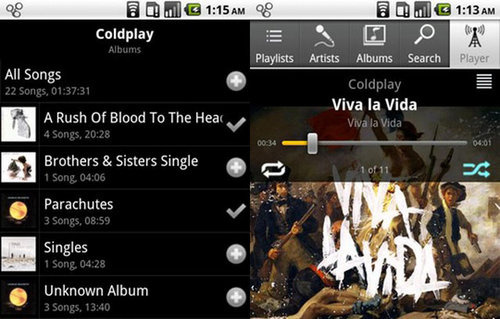 Unlike some of the other entries in this week's Hive Five that do double duty, streaming audio and video, Audiogalaxy remains completely focused on streaming music. You sign up for a free account at Audiogalaxy, install the server software on your Windows or Mac Machine, and get instant and organized music streaming to a remote web browser or your mobile device. Audiogalaxy includes drag and drop playlist creation, easy music search, and meta-data repair to help you clean up your sloppy music collection. As an especially nice perk, both the Android and iOS streaming apps are free. Orb Live is a hybrid solution for streaming to mobile devices. You install the Orb Live server software on your Windows or Mac computer, then you install the Orb Live streaming app on your Android or iOS device. All media accessible to your computer is then accessible to your mobile device: photos, music, movies—even live television if your computer has a tuner card. The server software is a free download and the mobile app for both Android and iOS is $9.99. Orb provides a demo version if you'd like to try it out before buying (Android/iOS), but the demo just picks three random media samples from your server to show off the technology, so it really is only good for testing purposes. PS3 Media Server was built to do exactly what it sounds like: transcode and stream media from your computer to a PS3 hooked up to your TV. Although that sounds fairly limited in scope, a lot of people like it for two principal reasons: It transcodes and streams video to the PS3 extremely well, but more importantly, the project very recently has branched out to other devices. People who have struggled with finding a good streaming solution for their PS3 units rave about how it's the best thing out there. Although the originally intended for just the PS3, as of earlier this year the PS3 Media Server beta releases have included support for other devices such as network-connected televisions. The Pearl Jam 20th anniversary party continues, this time with the band set to curate, host and headline their very own music festival next summer. During an interview aired on Sirius XM Radio, Gibson.com reports that longtime Pearl Jam manager Kelly Curtis said the festival will happen “somewhere in the middle of the U.S.” — not in the band’s hometown of Seattle. No other details have been released, but this sounds all very exciting! 2011 is going to be a big year for the Seattle band; the new year starts off with the January 18 release of Live on Ten Legs, which features 18 tracks recorded on tour by the band from 2003 to 2010. You could say the new album is a sequel to Live on Two Legs, the group’s first major live album released in 1998, which collected live performances from the band’s summer tour of ‘98. As for other 2011 Pearl Jam plans (so far), Eddie Vedder hits the road for a solo tour of Australia in March, and there’s talk of some possible album reissues that might be released. Part of this 20th anniversary fun included October’s launch of Pearl Jam’s own Sirius XM channel, which features archival concerts from throughout the band’s 20-year career, rarities, unreleased material from the band’s personal music library and music from the band’s side projects, including solo and pre-Pearl Jam music. As for the Pearl Jam Festival, the big details about performers, number of days – and hey, what it’ll be called – , is going to stay a closely guarded secret until the band decides to make a splashy media announcement about the festival. 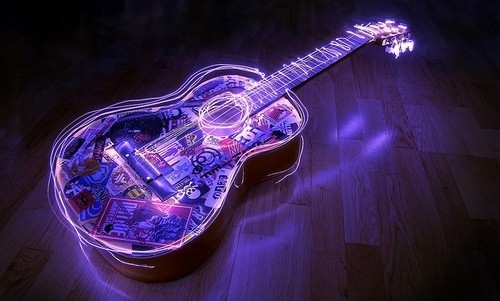 So until then we wait and wonder…. But it has all the makings of a great addition to the 2011 festival calendar.